Located just 15 minutes from Malaga airport Rincon de La Victoria is the western most resort along the Axarquia coastline. Despite its close proximity to the city of Malaga the resort has managed to develop an atmosphere of its own, which is due in part to the number of Malagueños (residents of Malaga) who choose Rincon as the ideal retreat from the hustle and bustle of city life. Many have purchased a second home here which in turn has led to a steady growth in Rincon de la Victoria's population and a transformation from a small seaside town into a modern beach resort. However it does not rely just on it's near neighbours for it's economic survival and with a good choice of holiday rental accommodation and Hotels in Rincon de la Victoria it has become a popular choice with holidaymakers from all over the Spanish peninsular and further a field. For more information on accommodation available in the region please see our accommodation page. 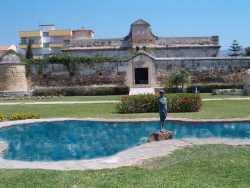 The origins of Rincon de la Victoria as a settlement go back to 550 A.D. however it's most prominent monument is the 18th century Casa Fuerte de Bezmiliana located on the coast road. Built at the request of King Carlos III in 1766 the fortification was part of the area's coastal defense system against Dutch and British pirates. Recent renovations have now turned the garrison buildings into an arts exhibition centre where works of international artists are regularly shown. Located to the north of the town is the Cueva del Tesoro or Treasure Caves. So named as legend has it that the 7th century emperor Tauslin Ibn Al hid all his treasure here from the invading Christians. However nothing other than a few artifacts have ever been discovered, so you never know you might just be lucky! During the summer months music concerts are held in the chambers of the caves. For more information on sightseeing in the region please see our sightseeing page. Rincon de la Victoria celebrates many fiestas throughout the year including the holy week of Semana Santa. Other local fiestas include Fiesta de la Tapa held in June this is a gastronomic celebration of the local varieties of "Tapas". Also there is the colourful Festival Flamenco Peña el Piyayo, Fiesta Virgen del Carmen and La Candelaria. For more information on fiestas in the region please see our fiestas page. Being a beach resort Rincon de la Victoria offers a wide range of watersports as well as activities such as beach volleyball and basketball. Golfers are catered for with the nearby 18 hole course Añoreta Golf. For more information on activities and sports in the region please see our sports and activities page. 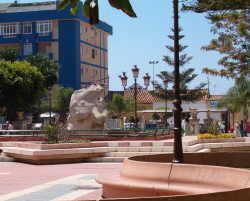 With a year round population the resort of Rincon de la Victoria hosts a good selection of shops and supermarkets. In addition there is the shopping mall Centro Comercial Rincon de la Victoria which is located on the Totalan exit of the autovia. For more information on shopping in the region please see our shopping page. Playa de Rincon de la Victoria is one of the regions widest and sandiest beaches. 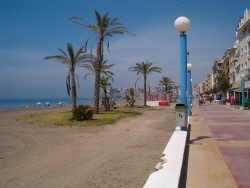 The beach and promenade stretches eastwards for approximatley six kilometres to nearby Torre de Benalgalbon. For more information on beaches in the region please see our beaches page. There are plenty of places to eat and drink in Rincon de la Victoria including a good choice of beach side retaurants and cafes along the promenade Paseo de la Marina. For more information on food and drink in the region please see our food and drink page.